Dive right in – this property is only a 1-minute walk from Onot Beach! 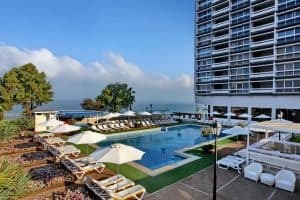 Featuring a spa with sauna and a private beach area, The Seasons is a boutique hotel set on a cliff overlooking the coast of Netanya. It offers sea views and a half Olympic-size pool. 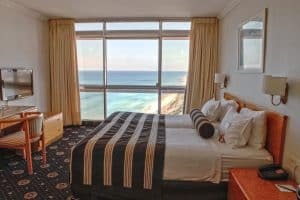 The spacious rooms at The Seasons on the sea feature sea views, air conditioning, and an LCD TV. They all include separate seating and sleeping areas, and free Wi-Fi. The breakfast buffet includes sweet and savoury foods and a variety of healthy options such as cereals, fruits and vegetables. The on-site restaurant serves lunch and dinner indoors or outdoors on the Summer Terrace. The Seasons Tamnun Beach provide free chairs and special discounts in several services to all guests. Free Wi-Fi is also available here. The Hotel Seasons is just a 5-minute walk to the city centre. The city of Tel Aviv is about 25 minutes away by car. Parking is free at the Seasons. Solo travellers particularly like the location — they rated it 9.3 for a one-person stay.